You’ve probably heard the phrase “content is king” once or twice since you’ve launched your website. At the very least you’ve picked up on the simple truth that content is the reason why people visit your humble online abode and share it with others. 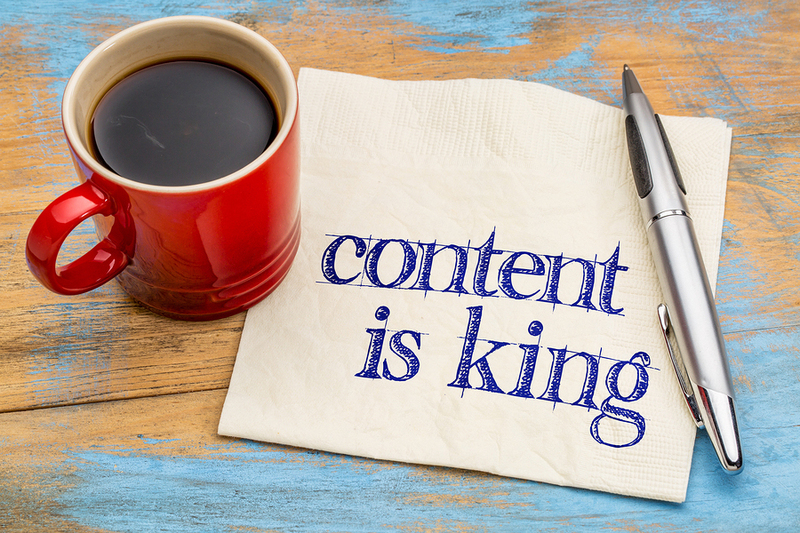 Basically, when it comes to a website’s success, content really is king. So what are we talking about when we say content? Verbiage is one the most crucial pieces of the content puzzle, however, words no longer comprise all of the content on a website. Today, everything you display on your website makes up its content. This includes text, images, videos, sounds, etc. When your customers visit your website, they need to be given a compilation of content that inspires a connection with your company, provides answers and solutions to their problems, and is distinctive to your business. Instead of merely conveying information in a drab and monotonous fashion, make use of wits and creativity to tell a complete story, forcing the visitor to glue their eyes to the screen till they have heard the whole of it. With no shortage of epic content on the web today, you need content that captivates the mind. Cookie cutter content just doesn’t cut it. Your content should be a living, breathing representation of who you are and what you have to offer. Failing to do so is failing to give the solutions or answers your visitors came looking for. If you understand visitors’ needs, you get their attention. Your purpose is simple: to get your message across to as many people as possible and as compellingly as possible. If your visitors aren’t turning into leads, it’s because they don’t know where to start. Your website can’t just be splattered with information, having no rhyme or reason. Your website has to be a cohesive and interactive experience—a collection of text and visual elements working together to deliver a comprehensive platform that tells your story. Outstanding content is not only what attracts new visitors, but also what entices them to stay for a while. If your content isn’t intriguing, your visitors are probably bouncing off into the arms of your competitors very quickly. Reviewing analytics will tell you how many visitors are sticking around to check out your content and how many are heading back out before they even get their foot in the door. No matter what type of business or organization you have, the goal is the same: conversion. Conversion comes in all different packages: sales, donations, followers, etc. The role of content (especially a strong call to action) is infallible in achieving maximum conversion. Content that encourages customers to participate in and interact with your business or organization translates into a dedicated fan base. So now that you’re thinking it’s time to up your content game, Net Designs is here to guide you through it. Unlike many website design companies that leave you to produce all of your own content, Net Designs has an in-house content writer! Net Designs crafts content that adds value and a high level of professionalism to your website with a consistent tone that adheres to your brand and voice. This sort of captivating content will help you meet your business goals, support marketing efforts, and keep visitors coming back for more. Net Designs understands that with the amount of competition online, business websites must think outside the box in order for content to garner the required attention. Net Designs does this for you by going above and beyond to make use of engaging and interactive storytelling techniques that make an impression on your target audience. Because it isn’t just the story itself, but the way you tell it that matters. Contact Net Designs today to hit refresh on your website’s content strategy! Exclusive Behind the Scenes Look at Net Designs! Ugly Website? We Can Fix That! Why Do I Need a Website Designer?